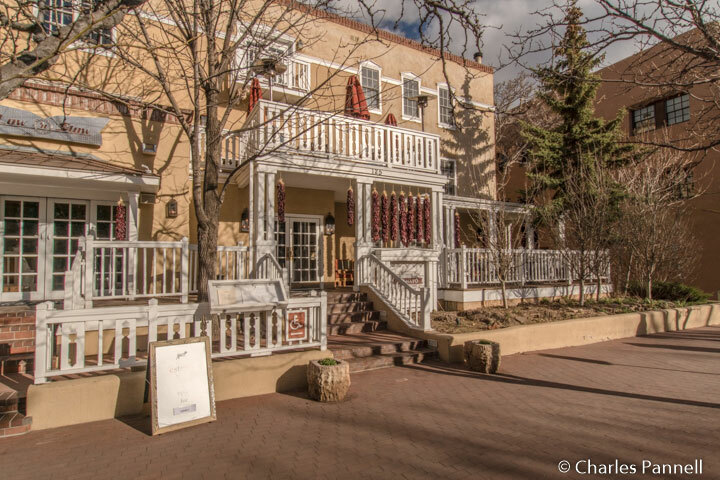 Located just a block from the historic Santa Fe Plaza, the Hotel Chimayo (www.hotelchimayo.com) takes its name from a Northern New Mexican town that dates back to the 17th century. And although this upscale boutique hotel offers a bevy of modern creature comforts and upgraded access features; it also celebrates the history and culture of its namesake village, through the use of traditional architecture, hand-crafted furnishings and original artwork throughout the property. Dont be dismayed when you spy the steps that grace the front entrance of this adobe structure, as there’s also a ramped entrance on the left side of the building. Accessible parking is located in an underground garage, with elevator access up to the lobby. There’s barrier-free access throughout the lobby, which is adorned with Viga ceilings, hand woven-textiles and a collection of retablos — small religious paintings — that are incorporated into the design of the massive brick fireplace. 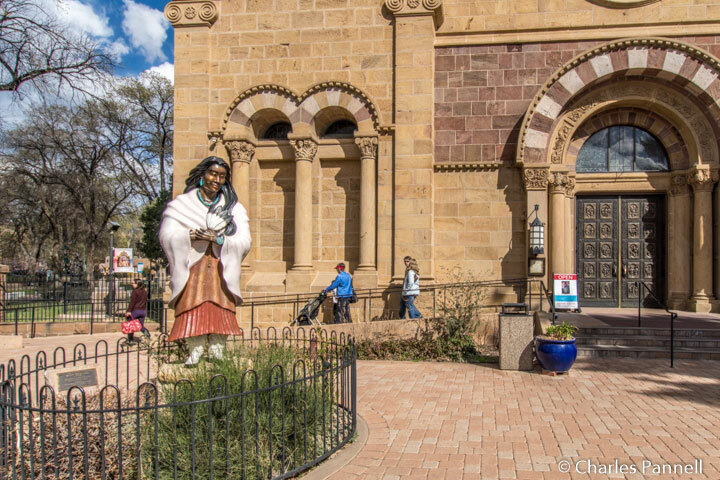 Add in a large crucifix on the mantle, an adjacent hand-carved altar, and a collection of Spanish colonial wooden furniture, and you get a real feel for historic Chimayo. Room 102 — an accessible king junior suite — is located near the front lobby, just off a brick courtyard that’s accented with colorful bunches of hanging chiles. Access features in the spacious suite include wide doorways, good pathway access, and low-pile carpet for easy rolling. The living room is furnished with two easy chairs, a desk with a chair, a TV, a refrigerator and a wet bar. It also includes a wood-burning fireplace; that comes complete with wood, kindling, and a person to start the fire. Just call the front desk, and they’ll send someone by to light a cozy fire, and they’ll even leave a stock of wood for the night. A 28-inch high king-sized bed with wheelchair access on the right side (as you face it), is located in a separate alcove. Other furnishings include a chest of drawers and a TV. Top it off with a lowered closet rod and you have a very accessible suite. 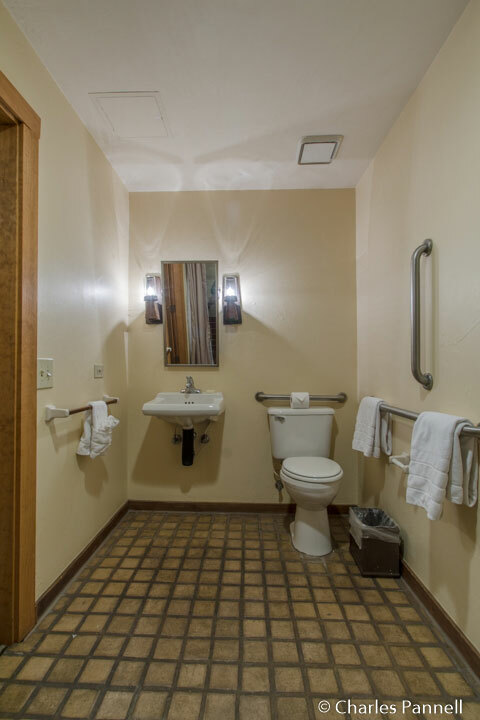 There’s barrier-free access to the adjacent bathroom, which has a tile floor and a full five-foot turning radius. 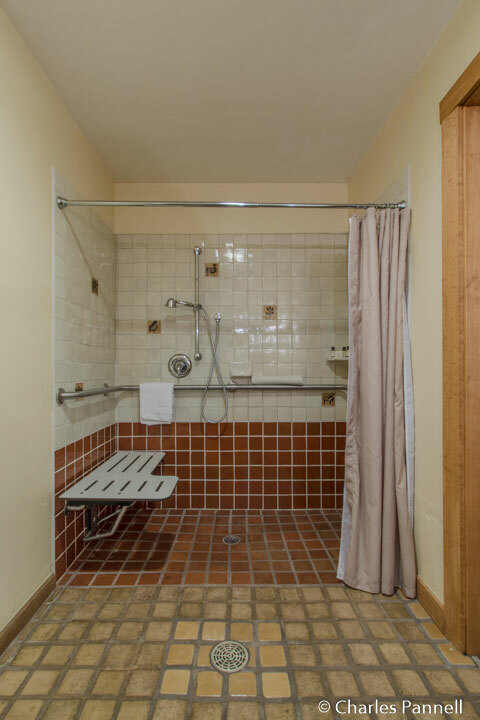 It’s equipped with a roll-in shower with grab bars, a hand-held showerhead and a fold-down shower bench. The tile shower is nicely designed for access — it’s not a prefab unit — as evidenced by the shower controls that are located within easy reach of the shower bench. The toilet grab bars are located on the back and left walls (as seated), and the bathroom also has a roll-under sink and an angled mirror. It’s a very accessible and comfortable suite; and as an added bonus it also includes some historic photos and custom artwork. In fact more than 70 Chimayo artists created the artwork and furniture that adorns this property; and that’s quite a tribute to the small town. There’s good access to the public areas of the property, including the Low ’n Slow Lowrider Bar on the second floor. It’s not often that you find a bar with diamond-tuck upholstered seats, and chrome chain-link steering wheel tables, so be sure and stop in for at least one drink. They also have a great happy hour — two times daily during the week. 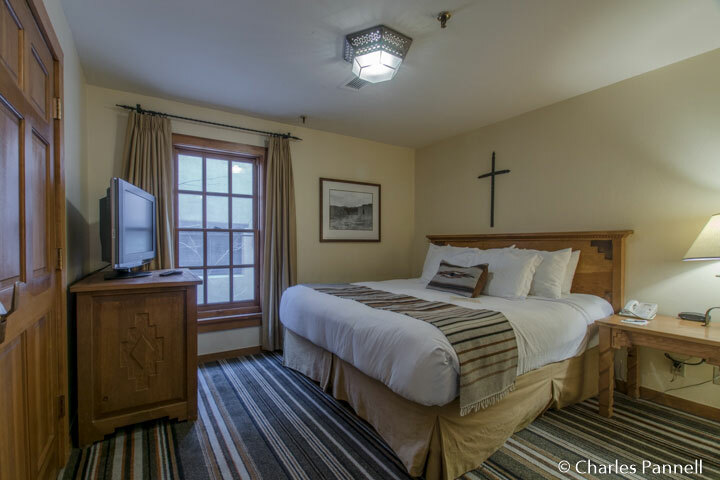 And you just can’t beat the location of the Hotel Chimayo, as it’s within rolling distance of all the major attractions. You can park your car for the duration of your stay, and explore the historic district on foot. And if you want to take a break during the day, your comfortable room is just steps away. 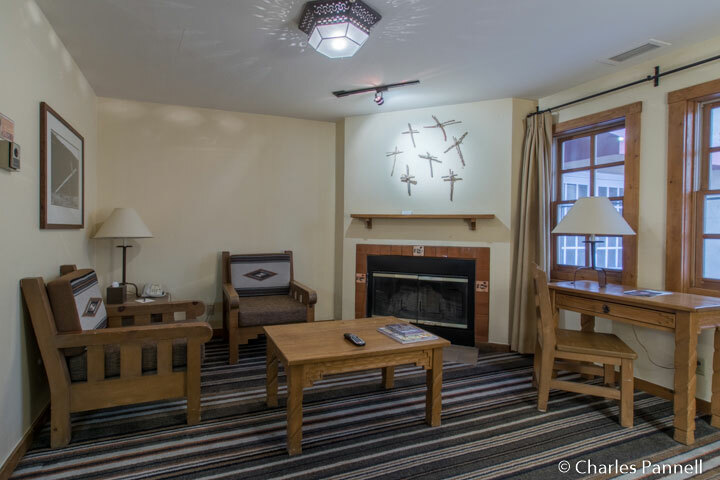 Good wheelchair access, comfortable rooms, and a prime location — the Hotel Chimayo truly has it all.